On August 8, 2010, the Chennai Trekking Club (CTC) – a non-profit group of 7000 trekking enthusiasts is planning for mission “Save Tada/2” – anenvironmental awarenesscampaign to restore the beauty of the scenic Tada waterfalls, 2 hours North of Chennai. Crystal clear streams that are the lifelines of a pristine jungle. Lush green forests, chirping birds, teeming aquatic life, beautiful mountains and exquisite falls. A mysteriously beautiful interior that lures anybody who cares to see. A favorite spot for families as well as trekking enthusiasts. This is what Tada used to be just a few years back. Today it consists of mutilated streams choked with plastics and broken alcohol bottles. Poetically beatiful rock crevices turned to garbage holders. Families and innocent visitors harassed by gangs of drunkards. Cars broken into and valuables stolen. 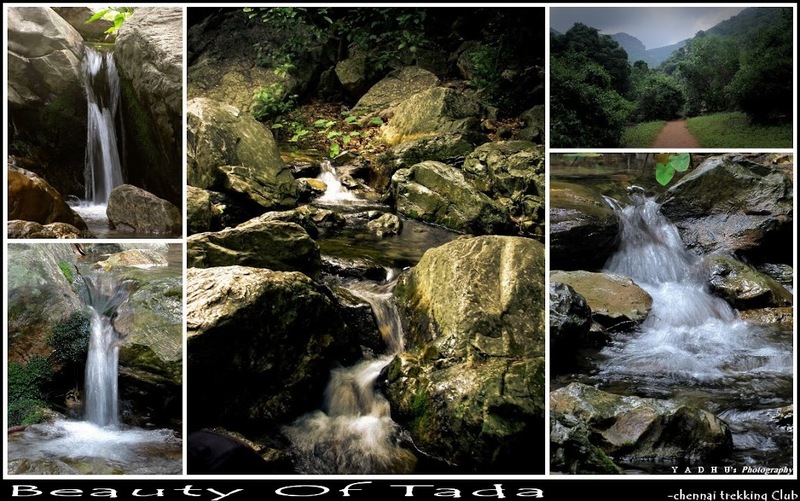 Tada has become a destination of anti-social elements which are transforming this beautiful natural spot to a garbage dump and make it unsafe for families and trekkers to visit. 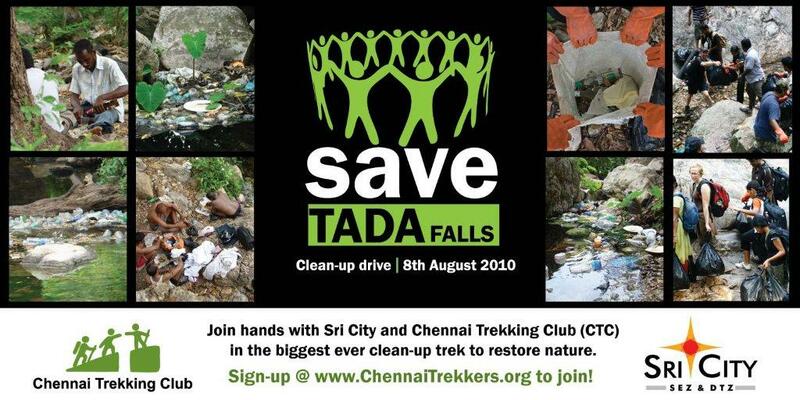 We are planning to clean up the entire Tada stream with500+ volunteers. CTC will provide garbage busting bags and gloves for the volunteers and ensure hygienic conditions. The operation also covers an 800m stretch of intense pollution. CTC is focused on bringing back the lovely Tada to its original beauty. We are working in hand with the Forest Department officials to find permanent solutions to the problems created with the drunkard gangs at Tada. The key to the mission is to generate enough momentum and awareness among the public to ensure that such anti-social activities are stopped. We are a 7000+ member non-profit group of trekking enthusiasts and the largest and most active group of outdoor enthusiasts in South India. 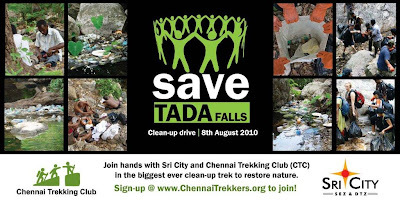 The club is run by several passionate volunteers who organize various outdoor events every weekend – treks to various parts of South and North India, biking, cycling, mountaineering, environmental awareness campaigns and clean-up campaigns. 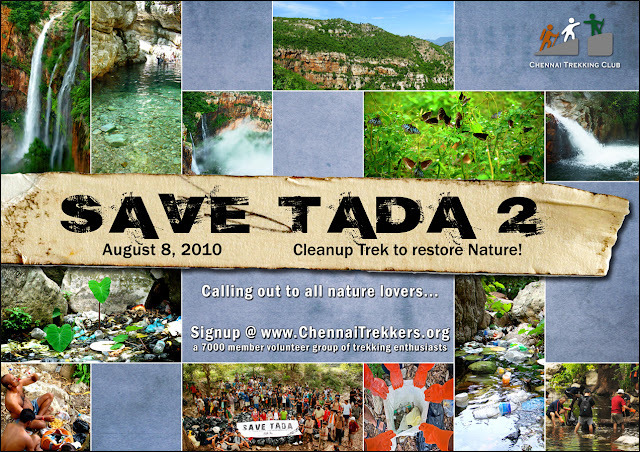 The Save Tada/1 done on Nov 1, 2009 involved 230 enthusiastic volunteers who collected over 2 tonnes of trash from the Tada stream. 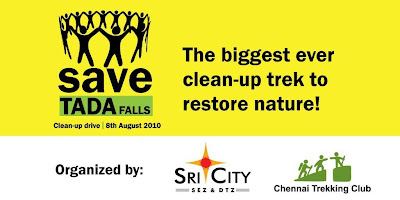 Chennai Coastal Cleanup held on May 16, 2010 is estimated to have collected over 5 tonnes of trash over 15 km of chennai coastline with 900 volunteers. From May 16th, CTC has been organizing beach clean-up campaigns at one select beach every weekend, involving the public as well as various groups and corporates, with 25 to 150 volunteers for each drive.